The Templars and Their Sources. 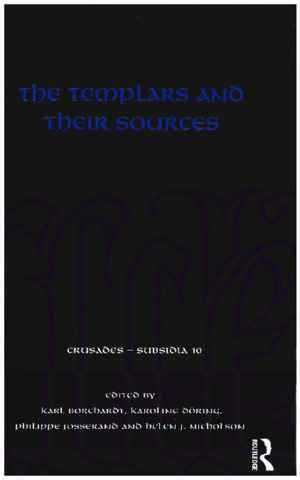 "The Templars and their Sources" appears as tenth volume of the series "Crusades Subsidia" and contains twenty contributions in six sections. These go back to an international conference held in Munich from February 24–27, 2014 on the initiative of the Monumenta Germaniae Historica and the Department of History of the Ludwig-Maximilians-University. In the first part, entitled "Headquarters", Benjamin Z. Kedar first presents the "Vestiges of Templar presence in the Aqsa Mosque" (pp. 3–24). The contribution, which offers a convincing reconstruction of the Templar compounds in the 12th century, is very impressive due to the numerous and revealing illustrations from the Israel Architecture Archive. Jochen Burgtorf examines the relationship between "The Templars and the kings of Jerusalem" (pp. 25–37) and emphasizes that the Templars maintained a network at the royal court, but their depiction by the chronicler William of Tyros was not presented without intentions. Anthony Luttrel focuses on "The Templars' archives in Syria and Cyprus" (pp. 38–46) and leads to the second and most comprehensive part of the volume. He works out that the first Templar archive in Jerusalem was probably partially destroyed in 1187. In case of Akko's destruction in 1291 it seems to have come to even greater losses than in Jerusalem, so that only fragments have survived. The section "Charters" examines many aspects of the Templars and their documents. In his paper "Templar charters and charters for the Templars: self-promotion versus the images of the Order" (pp. 49–63) Karl Borchardt gives a concise overview of the possibilities of editing charter material. He assumes the number of the documents in a five-digit range and collects arguments for an edition of Templar documents. Michael J. Peixoto shows in his text "Copies and cartularies: modernizing Templar documents in mid-thirteenth-century Champagne" (p. 64–77) that in the region of Champagne non-Templar authorities, often bishops, deans, or official representatives of the count, issued most of the surviving Templar charters. Especially the form of the vidimus indicates a relatively high degree of tradition. In his essay "Editing Templar charters in the Iberian Peninsula at the beginning of the twenty-first century" (pp. 96–105) Philippe Josserand can demonstrate the surprising findings of 1747 documents, of which 464 documents date prior to the suppression of the Templars. Especially the different regions of the Crown of Aragon, particularly exhibition sites in Catalonia, stand out among these numerous documents. In his contribution "The Marquis d'Albon, Carl Erdmann and the Templar sources in Portugal" (pp. 106–122) Kristjan Toomaspoeg can show that Portugal has played an important role in the history of the Templar Order. There is a need for a new history of the Templars in Portugal because numerous unedited local Templar sources have survived. In the third Section about "Constitution, structure and finance" of the Templars Alan Forey analyses in detail how "The office of master deça mer in military orders" (pp. 125–132) could work. In his essay "The Templar Procurators: Diplomatic and legal aspects of their establishment and their tasks" (pp. 133–155) Christian Vogel can show that many officials within the Templar Order are known to modern scholars; nevertheless, their organisational structure needs further research. John France shows how the "Templar tactics" (pp. 156–165) developed on the battlefield. In his essay "Les ordres religieux-militaires et l'argent: sources et partiques" (pp. 166–184) Alain Demurger examines whether the Templars were the first bankers in the West to hoard a huge treasure, as has been claimed on several occasions, and shows that they invested a lot of money in land. The "spiritual character" of the Templars is analysed in the next section. In her article "Les Templiers et le progressif évanouissement de leur règle" (pp. 187–198) Simonetta Cerrini shows how the Templar rule has been handed down in various sources, as a rule itself, in the statutes or in selected court documents, and that it was increasingly mystified in favour of oral explanations during the 13th century. For his study of a Templar religion, Jochen Schenk evaluates inventories, libraries, devotional objects, Mass and cura animarum as well as liturgical garments and vestments (pp. 199–211). The statement made is based on Spanish examples, according to which Mass in Templar chapels and churches could be a colourful affair. Arno Mentzel-Reuters uses various text groups known to members of the Templar Order to ask whether there was a Templar spirituality (pp. 212–234). By evaluating different concepts such as purification, humility, prayer, silence and worship, "Wege" (ways), imitation of Christ and recognition, he analyses the efforts for a spiritual life with order-specific accents, but without Templar-specific forms. In Section 5 "Suppression and its consequences" Helen J. Nicholson and Philip Slavin deal with "'The real Da Vinci Code': the accounts of Templars' estates in England and Wales during the suppression of the Order" (pp. 237–247) and focus here on account rolls, which represent a vitally important source, unmatched by any other continental inventories. They show that the Templars, contrary to their repeated designation as financiers, were very wealthy and manorial landlords, contributing to various sectors of rural economy. In his text "Fratres quondam Templi: per i Templari in Italia dopo il concilio di Vienne e il destino di Pietro da Bologna" (pp. 248–306) Francesco Tommasi shows that some former Templars were able to flee to other regions after the Council of Vienna, others like Frater Giacomo to their places of birth. Elena Bellomo demonstrates in her article "Notaries in custody: the evidence from the Templar investigation in northern Italy" (pp. 307–320) how complicated the Templars' investigation has been. Several authorities and different types of notaries were involved to confirm their legal validity. The last section "After-history" deals with the Templars' connections to the Shroud of Turin and the sources of the Templar myths. In his paper "The Templars and the Shroud of Turin" (pp. 323–359), Karlheinz Dietz focuses on the research history of the Sindone di Torino (German prejudicial Turin Shroud). The connection of the Shroud with the Templars goes back to a thesis according to which the idol ("Baphomet") allegedly worshipped by the Templars was identical with the Shroud of Turin. In his text "Sources for the Templar myth" (pp. 360–371) John Walker gives an overview of the sources which are concerned with the myths of the "posthistory" of the Templars. They were often based on medieval sources and were only used very selectively. Partly the texts were manipulated; partly hidden meanings were interpreted into them. Conclusion: Since the Templars represent an area of historical research that is interspersed in the popular perception of myths and legends, volumes such as this one represent a path into the area of scientifically resilient statements. The contributions all point out the need for further research and show many sources from and about the Templar order, which are still unexplored. Most of the contributions show a considerable need for a wide range of edition projects on the numerous sources, especially charters. For this reason, and due to its international format, the volume represents a very good starting point for any future study of the Templars. Thomas Wozniak: Rezension zu: Borchardt, Karl; Döring, Karoline; Josserand, Philippe; Nicholson, Helen J (Hrsg. ): The Templars and Their Sources. London 2017 , in: H-Soz-Kult, 05.09.2018, <www.hsozkult.de/publicationreview/id/rezbuecher-28589>.